This is part 5 of 7-part series Artist profiles, for the participating artists of STITCH. These artists are creating work that are inspired by the words collected, for the Kickstarter rewards and to inspire more conversations. Erin’s sketches of Durham can be customized with your favorite word/place combination. Erin is an artist and teacher who loves to explore and make art. She concentrates on painting and drawing abstractly (you can see examples here), but enjoys mixing it up from time to time. For STITCH, she will be making realistic gesture drawings of Durham—all original pieces, made-to-order, and on ephemeral, translucent paper. Erin is originally from the Northeast, but has found a great new community in Durham to call home. Claudia Corletto and I met at a lunch get-together organized by another brilliant artist/organizer Michelle Gonzalez Green, who had a handful of us gather around community activist and artist Lily Yeh, who had just been visiting Duke to present her work there. It was an unforgettable occasion, full of compassionate sharing of wisdom, stories, and learning. Claudia showed us her clutch that she made, and the story of how she came to be an artist. She struck me as confident, quick-witted yet thoughtful. I knew we could do something together. Even though STITCH was well underway, I asked her if she was interested in participating, and to my delight she said yes! Her creation for STITCH is simple yet compelling: a wearable work of art that’s affordable yet personal. 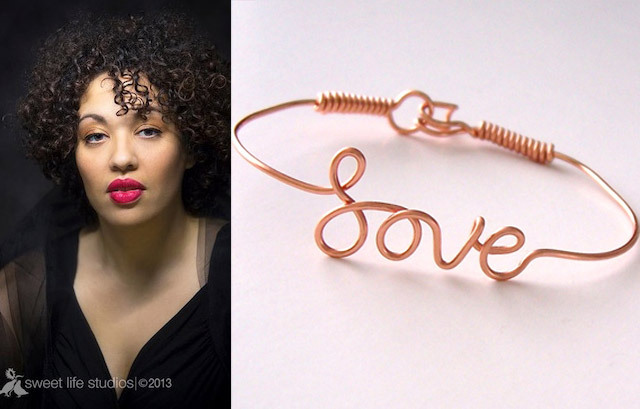 A word, chosen by you, will be spelled out with a single wire bent to the shape of the letters. “A perfect visual expression to the heartfelt sentiments of those that adore their beloved Bull City.” See more of Claudia’s work at her site. As I got to know her more through the project, I’ve come to know both of these ladies to be quite fun and vivacious. We’ve had conversations about markets, feminism, development and art scene, and other things not quite fit for print 🙂 I hope you will get to meet them in person at one of our PopUp shows!